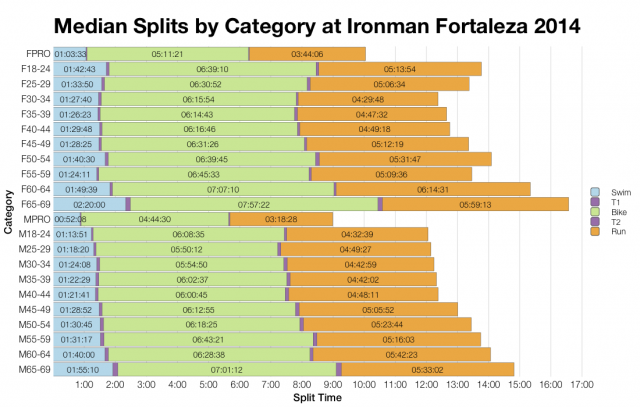 I’ll be honest, I thought my work was done with my analysis of Ironman Florida’s results yesterday, but there was a second race at the weekend: Ironman Fortaleza. Only in its second year, Fortaleza has lost both the pro field and half of its age groupers – fewer than 600 athletes appear to have started this year’s race. With 50 Kona slots on offer, that’s not bad odds. 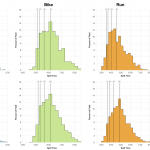 If we look at the finishing distribution, this year’s race isn’t that different to the last. The front of pack is a little slower, but that may be due to the lack of pros. The middle of the field is a little faster, although the reduction in athlete numbers may help to skew this. Overall it looks to have been a faster race that’s thinned out at the front. The swim was significantly faster this year and the run also had a boost in speed. On the other hand bike times were very slightly down on the previous results. DNS and DNF rates also dropped at the 2015 race. Some swim times are missing from the results which makes it harder to be sure of exact figures at this point. 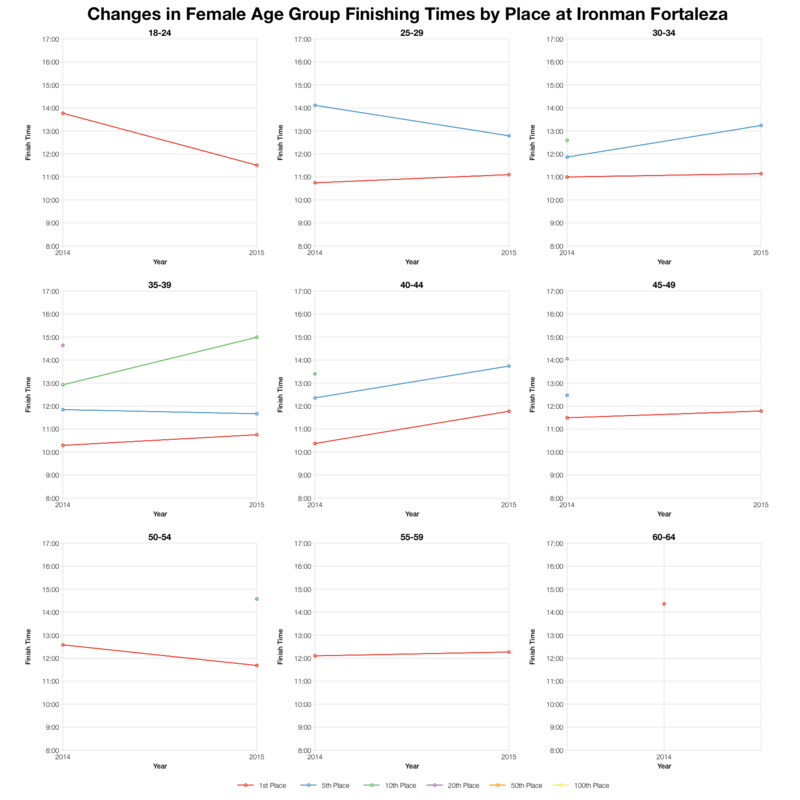 I suspect the change reflects a lower DNS number and that the DNF rate is similar to the previous year. 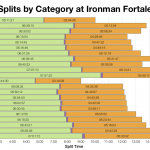 Age Group medians follow the same trend as the distributions – faster swim and run times and largely similar bike times. 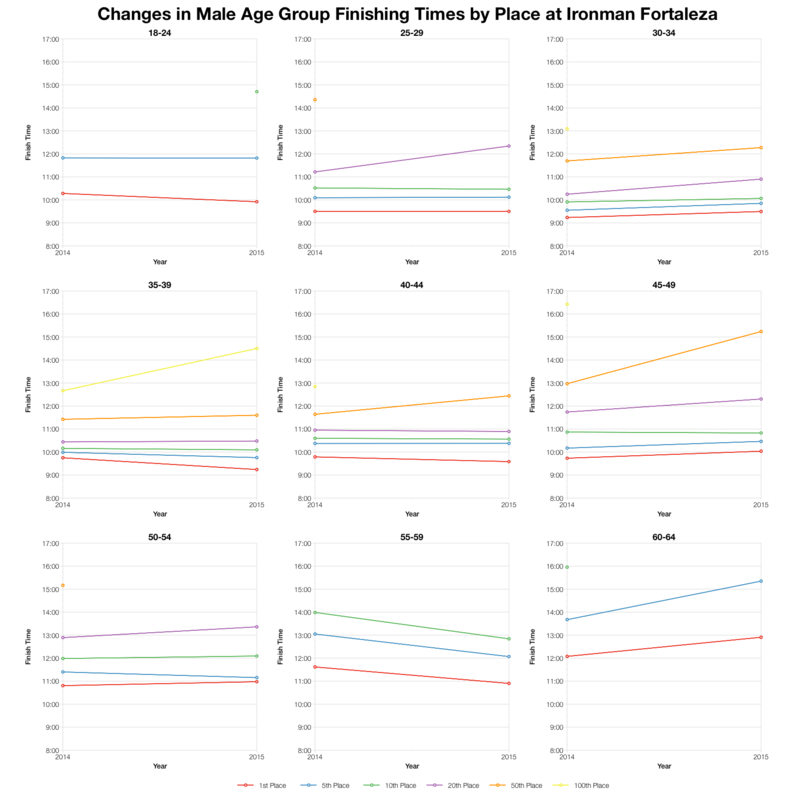 Comparing times for specific placings within each age group over the two years presents quite a mixed pattern. 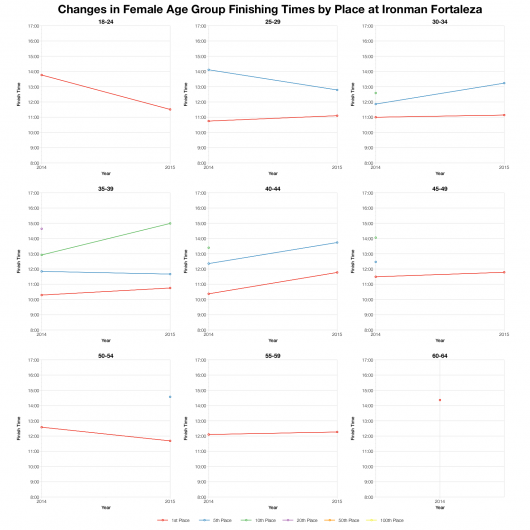 The reduction in athlete numbers means that for some of the higher placings, times are either distinctly slower (much further back relatively in the field) or absent. Where we have times to compare the pattern varies, sometimes faster and sometimes slower. At the overall level there aren’t many differences between the two years. 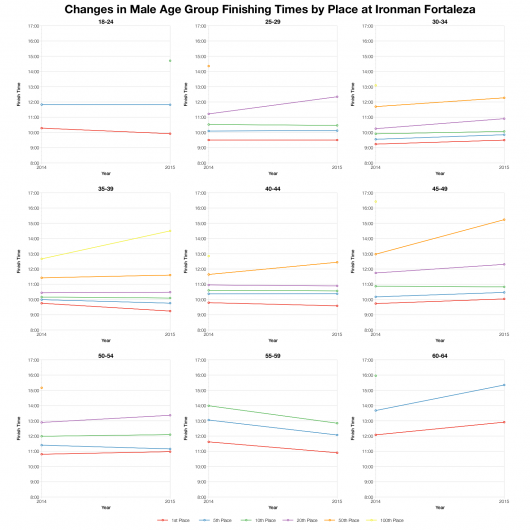 Top twenty age group times at this years race don’t vary that much from their 2014 counterparts. 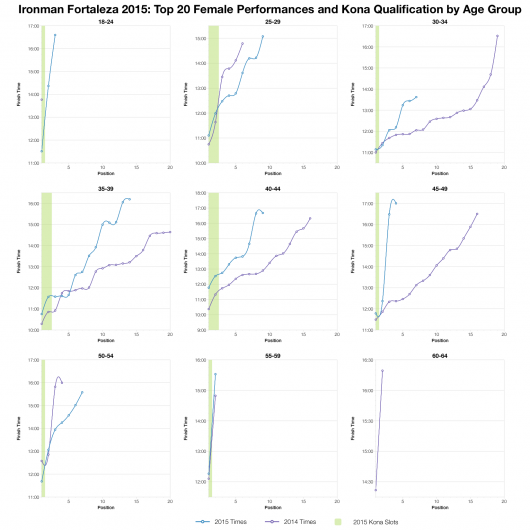 At least not when considering the major male age groups that dominate the field. Outside of that there’s a bit more variance and separation between the two years of results. 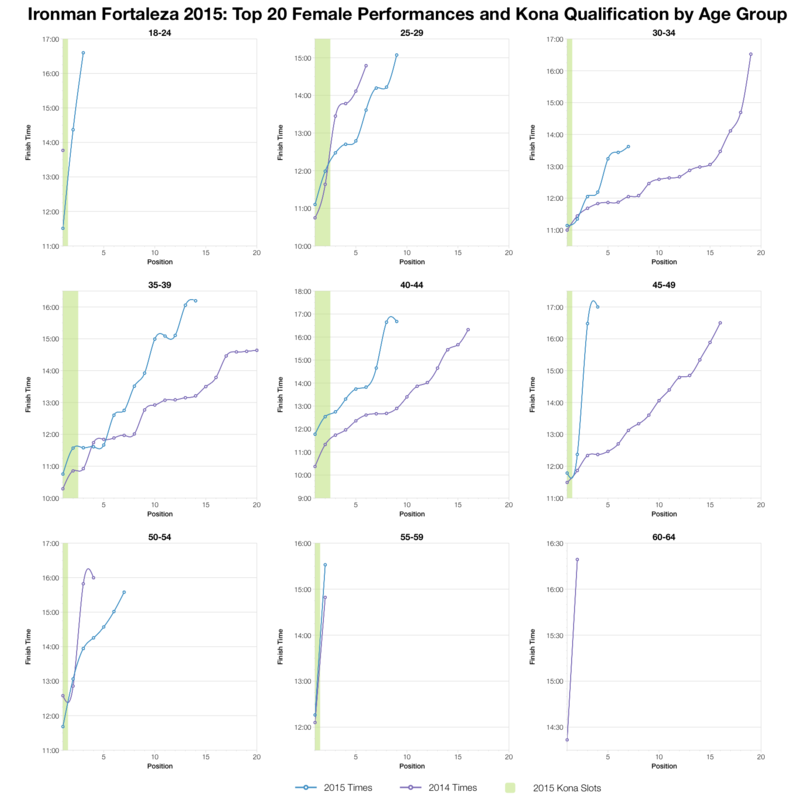 Again, there’s not a distinct pattern in this, it varies with age group. 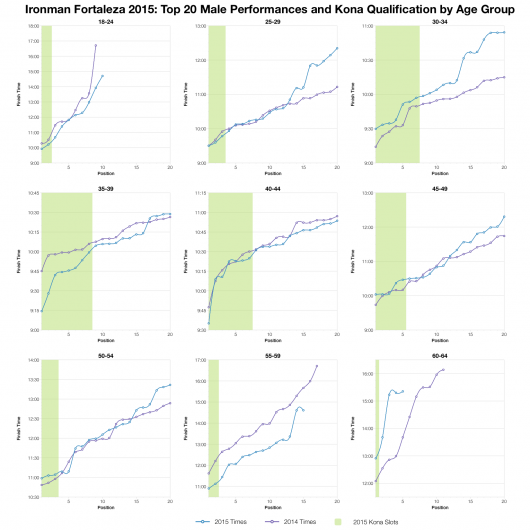 Although overall numbers are down, times for Kona qualification are broadly comparable with 2014. 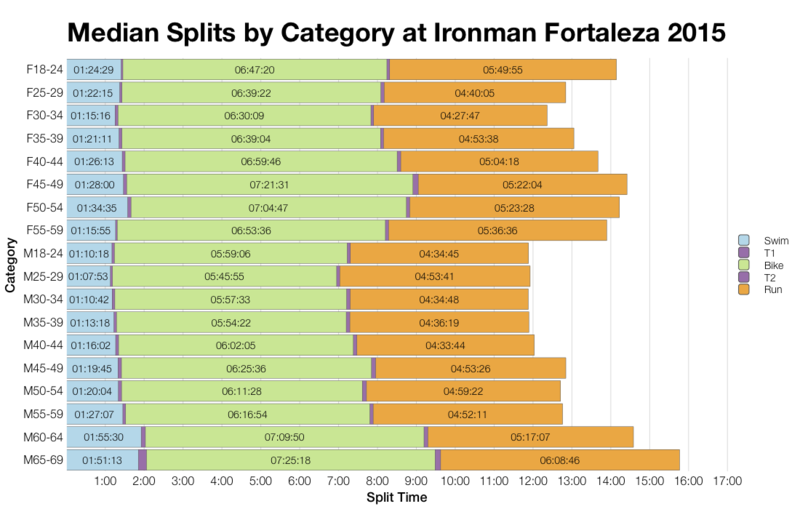 You can access a spreadsheet of the full results and splits from Ironman Fortaleza 2015 on my Google Drive.